Avatar: The Last Airbender is a popular anime series that aired on Nickelodeon in the United States. The premise of the show is that certain people are able to “bend” the four elements, Fire, Earth, Air, and Water. The show has martial arts and spiritual themes based on Asian and Inuit cultures. Uncle Iroh is a former Crown Prince of the land and a General in the war. 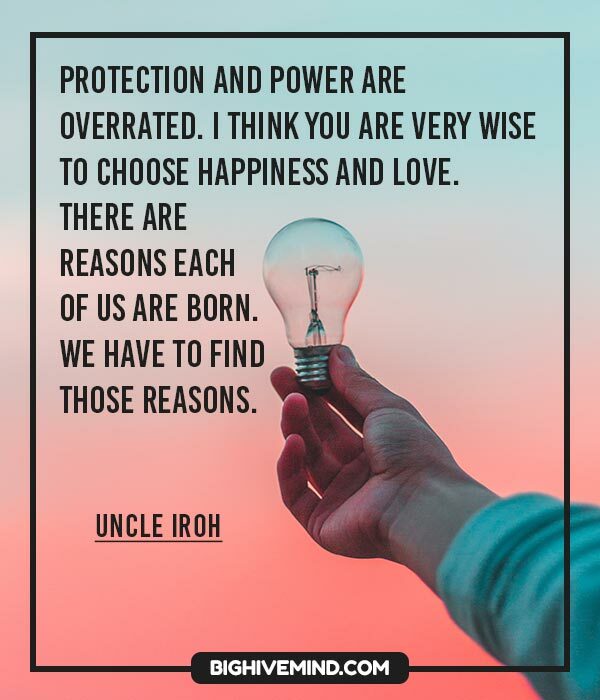 Uncle Iroh is a great source of support to the main character, Aang, and his friends. 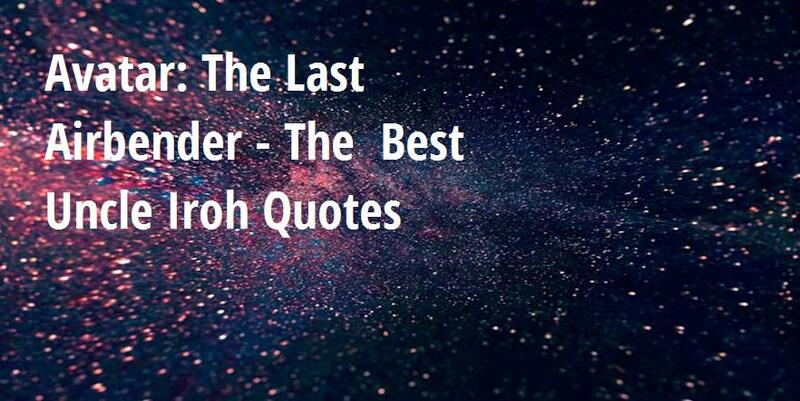 Enjoy these quotes from Uncle Iroh. They are inspirational and funny, and bring the characters hope in difficult times. Protection and power are overrated. I think you are very wise to choose happiness and love.There are reasons each of us are born. we have to find those reasons. You are going through a metamorphosis, my nephew. It will not be a pleasant experience but when you come out of it. You will be the beautiful prince you were always meant to be. Many things that seem threatening in the dark become welcoming when we shine light on them. 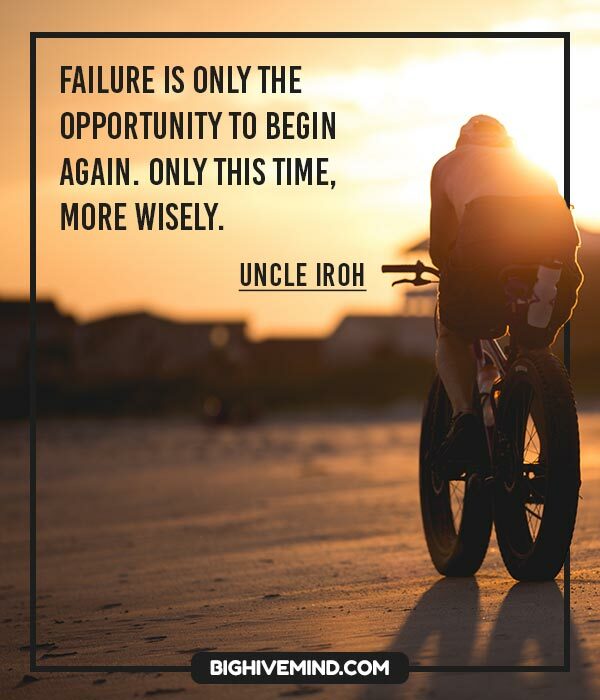 Failure is only the opportunity to begin again. Only this time, more wisely. I am surprised, Prince Zuko. Surprised that you are not at this moment trying to capture the Avatar. No! Zuko! You must never give into despair. Allow yourself to slip down that road and you surrender to your lowest instincts. In the darkest times, hope is something you give yourself. That is the meaning of inner strength. Lightning is a pure expression of firebending without aggression. It is not fueled by rage or emotion the way other firebending is. Some call lightning the cold-blooded fire. It is precise and deadly like Azula. To perform the technique requires peace of mind. You know, Prince Zuko, destiny is a funny thing. You never know how things are going to work out. But if you keep an open mind and an open heart, I promise you will find your own destiny someday. 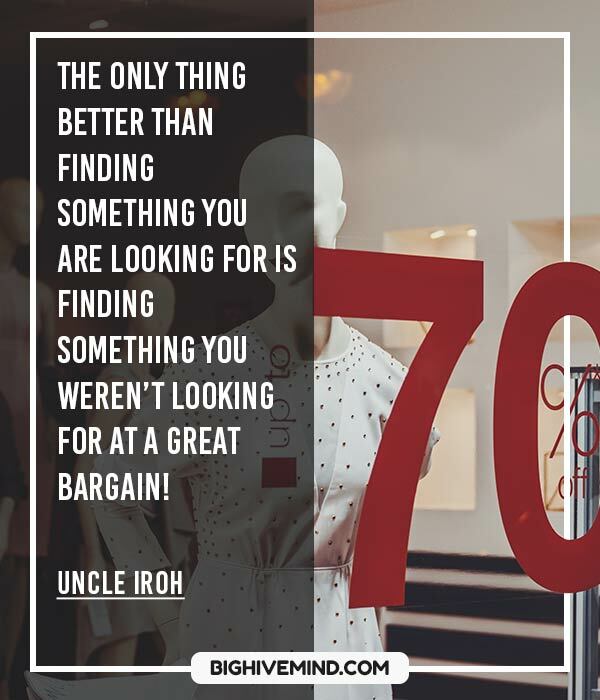 The only thing better than finding something you are looking for is finding something you weren’t looking for at a great bargain! Once, when I was a…different man. You must look within yourself to save yourself from your other self. Only then will your true self reveal itself. Is it your own destiny? Or is it a destiny someone else has tried to force on you? You should know this is not a natural sickness. But that shouldn’t stop you from enjoying tea. The coin is appreciated…but not as much as your smile. There is energy all around us. The energy is both yin and yang — positive energy and a negative energy. Only a select few Firebenders can separate these energies. This creates an imbalance. The energy wants to restore balance, and in the moment the postive and negative energy come crashing back together, you provide release and guidance, creating lightning. This tea is nothing more than hot leaf juice! Delectable tea or deadly poison. Forgive my nephew; he is not an initiate and has little appreciation for the cryptic arts.Power in firebending comes from the breath, not the muscle! Who knew that floating on a piece of drift wood for three weeks with no food or water… and sea volchers waiting to pluck out your liver could make one so tense. This is what I’ve been missing. Who knew floating on a piece of driftwood for three weeks, with no food or water, and sea vultures waiting to pluck out your liver, could make on SO tense! We have a chance for a new life here. If you start stirring up trouble, we could lose all the good things that are happening for us. I know your not supposed to cry over spilled tea, but it’s just so sad! No. Someone new must take the throne. An idealist with a pure heart, and unquestionable honor. It has to be *you*, Prince Zuko. There is nothing wrong with letting people who love you, help you. Not that I love you. I just met you. If you look for the light, you can often find it. But if you look for the dark, that is all you’ll ever see. Goodbye everyone. Today, destiny is our friend. I know it. Look what I found! These are packue berries, known to cure the poison of the white jade plant… THAT, or makaoli berries that cause blindness. I was never angry with you. I was sad, because I was afraid you’d lose your way. While it is always best to believe in oneself, a little help from others can be a great blessing. Is it your own destiny, or is a destiny someone else has tried to force on you? At my age there is really only one big surprise left, and I’d just as soon leave it a mystery. Water is the element of change. The people of the Water Tribes are capable of adapting to many things. They have a sense of community and love that holds them together through anything. That’s true. But you are clearly outmatched. You’re looking at the rare white dragon bush. Its leaves make a tea so delicious it’s *heartbreaking! * That, or it’s the white jade bush, which is poisonous. I know your not supposed to cry over spilled tea, but [cries] it’s just so sad! Only once every hundred years can a Firebender experience this kind of power. You struggled, you suffered, but you have always followed your own path. You’ve restored your own honor, and only you can restore the honor of the Fire Nation. Whatever you do to that spirit, I’ll unleash on you tenfold! Let it go now! So I was thinking about names for my new tea shop… How about… the Jasmine Dragon? It’s dramatic, poetic… has a nice ring to it. So this is how the great commander Zhao acts in defeat… disgraceful! Even in exile my nephew is more honorable then you. Thanks again for the tea. It was delicious. Is it your own destiny, or is it a destiny someone else has tried to force on you? … It’s time for you to look inward and begin asking yourself the big questions. Who are you and what do you want? Are you going to keep him locked up in your apartment? Should I make some tea for him? AND THEN WHAT? You never think these things through. This is exactly what happens when you captured the Avatar at the North Pole. YOU HAD HIM AND THEN YOU HAD NOWHERE TO GO! Sick of tea? That’s like being sick of *breathing*! Winner of ‘Most Supportive Parental Figure’ three times running. In part because all other parental figures in ATLA are absent or evil. Or dead. Air is the element of freedom. The Air Nomads detached themselves from worldly concerns, and they found peace and freedom. [pause] And they apparently had great senses of humor. Pride is not the opposite of shame, but it’s source. True humility is the only antidote to shame. I’m not going to shoot lightning at you! Even if I did defeat Ozai, and I don’t know that I could, it would be the wrong way to end the war. History would see it as just more senseless violence, a brother killing a brother to grab power. The only way for this was to end peacefully is for the Avatar to defeat the Fire Lord. There’s nothing wrong with a life of peace and prosperity. I suggest you think about what it is that you want from your life, and why. It is important to draw wisdom from different places. If you take it from only one place it become rigid and stale. You have come to the crossroads of your destiny. It is time for you to choose. It is time for you to choose good. Be careful what you wish for, Admiral. History is not always kind to its subjects. Good news for the Fire Lord. The nation’s greatest threat is just a little kid. Sometimes life is like this dark tunnel, you can’t always see the light at the end of the tunnel, but if you just keep moving, you will come to a better place. Fire is the element of power. The people of the Fire Nation have desire and will, and the energy and drive to achieve what they want. I was about to ask you the same thing. What do you plan to do now that you’ve found the avatar’s bison? Who would have thought that, after all these years, I would return to the scene of my greatest military disgrace… as a tourist! You are not the man you used to be. You are stronger and wiser and freer than you ever used to be. And now you have come at the crossroads of the destiny. Its time for you to choose. Its time for you to choose good. At my age, there is really only one big surprise left, and I’d just as soon leave it a mystery. Understanding others, the other elements, the other nations, will help you become whole. I’m begging you, Prince Zuko!” It’s time for you to look inward and start asking yourself the big questions: Who are you? And what do you want? Sharing tea with a fascinating stranger is one of life’s true delights. Life happens wherever you are, whether you make it or not. It is usually best to admit mistakes when they occur, and to seek to restore honor. A man needs his rest. It was not by chance that for generations people have been searching for him, and now you have found him.